BouOuOuOu... BouOuOuOuuuuu... and it's full perm! MTD Designs, like all creators who are on the sim, give a freebie in their shop, and put a gift in a skull. 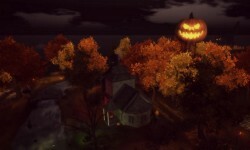 To find in Pumpkin Town!